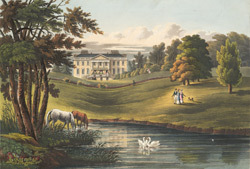 At the time of this drawing, Claremont was the seat of Princess Charlotte of Saxe-Coburg. It was originally built by the architect Sir John Vanbrugh, who bought the estate and lived there from 1708. It was considerably enlarged for its next owner Thomas Pelham, Earl of Clare, several years later. The entire house was demolished in 1768 and replaced by this more fashionable and practical design, which was the work of Henry Holland and Lancelot 'Capability' Brown. The young architect John Soane worked here under the instruction of Holland. Much of Vanbrugh's original work survives in the gardens, particularly the Belvedere and garden walls.